In Being Both, I document the idea that interfaith children benefit from interfaith education. Learning about more than one religion from a young age yields specific benefits for children who have more than one religion in the extended family. But I also write about the idea that every child, in this era of global interconnection, would benefit from learning about the religions in the neighborhood, and the religions of the world. 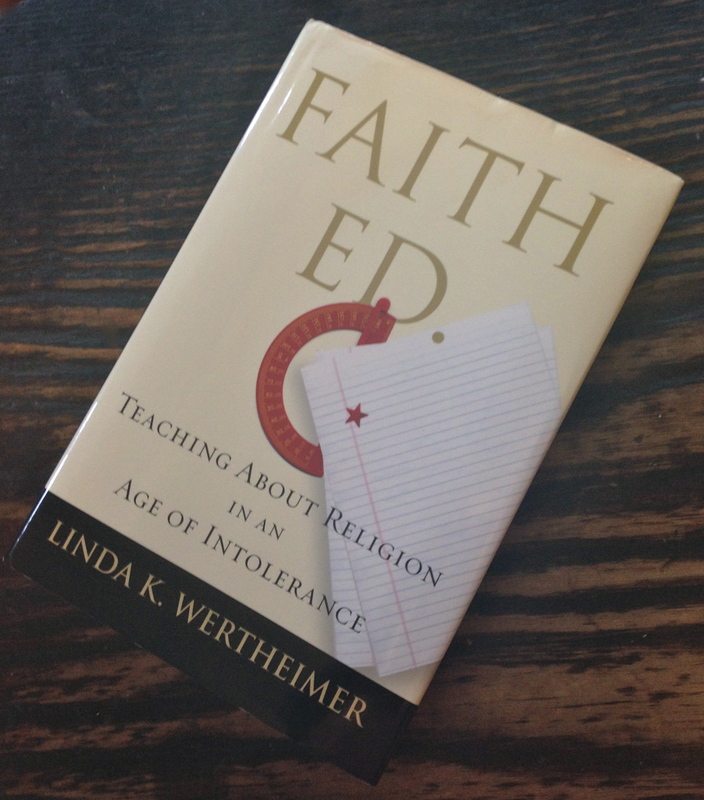 In an important new book from Beacon Press (disclosure–Beacon is my publisher) entitled Faith Ed: Teaching About Religion in an Age of Intolerance, journalist Linda K. Wertheimer reports on efforts around the country to teach (not preach) more than one religion in public school classrooms. The book essentially starts from the premise that teaching religions in public schools is a key to combating religious ignorance. But how best to accomplish the task? How do schools negotiate the tension between separation of church and state, and the desire to teach interactive and multi-sensory interfaith education? Are field trips to mosques and temples necessary, or somehow risky? What age is the right age to teach about religions in the public schools? What effect does interfaith education have on children from minority religions? And for those in the religious majority (usually Christians), can these programs reduce religious ignorance and intolerance? The book is a lively read: a travelogue of Wertheimer’s encounters as she crisscrosses the country to report on both the model classrooms and the controversies. She takes us to Texas, where a high school teacher gets into hot water for letting her students try on a burka while studying Islam. Then we travel to suburban Boston, where a middle school comes under scrutiny after a field trip to a mosque. In Florida, we learn about how a particular guest speaker in the world religions program attracted unwanted national attention for a high school in Tampa. In Kansas, Wertheimer reports on the pressures encountered by an elementary school teaching about Judaism, Christianity, and Islam. And in Modesto, in the “California Bible Belt,” she describes how high school teachers manage to teach world religions in a context of megachurches and a growing Sikh minority. In a memoir thread running through the book, Wertheimer returns to her childhood home in rural Ohio to confront the “Church Lady” who taught Bible stories in her elementary school classroom in the 1970s. Her poignant description of feeling very uncomfortable as the only Jewish girl in the class still has great relevance today. Wertheimer finds Christian education (preaching, not just teaching) still going on during the school day in some schools, though students leave to attend this religious school just off campus. Throughout the book, Wertheimer skillfully weaves a brief history of religion in the schools, key legal cases, and some theory, into her reporting. I wish Faith Ed included a closer look at some of the interfaith education models developed around the world, including in the UK (which requires interfaith education in government-funded schools), in Unitarian-Universalist communities (which have long taught world religions in a context of teaching and not preaching) and in interfaith families communities (which also teach more than one religion without imposing a specific creed). American educators developing multi-religious education for secular schools would benefit from exchanging resources, curricula, and strategies with those in other countries, and those in the inclusivist religious world with expertise in teaching more than one religion. But this slim book is sure to spark necessary conversations on the importance of interfaith education in the schools. Students, parents and teachers in the book testify to the idea that education about religions is a key strategy to prevent bullying, fear, and alienation, among children from religious minorities. Faith Ed is timely, provocative, and essential reading for all of us in religiously plural settings in America, which is to say, for all of us.